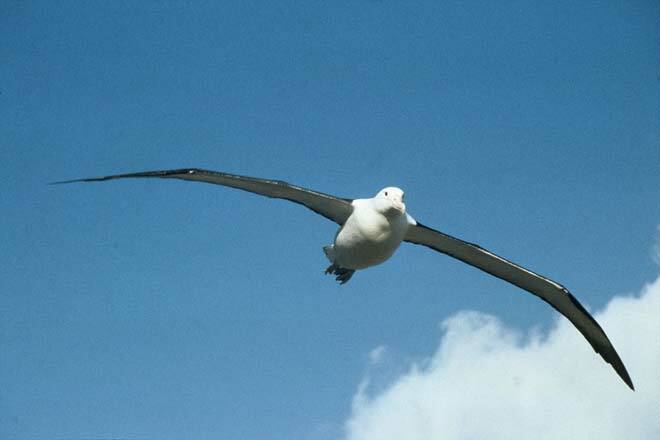 Albatrosses use very little energy to cover huge distances across the ocean. They use the wind for lift, their narrow cambered wings acting as an aerofoil like those of a glider. A shoulder-lock tendon helps brace the wings, reducing the effort for muscles. The birds face into the wind to gain height, and coast in a wide, descending loop, gradually losing height until they need to climb again. In stormy seas they gain lift from wind deflected upwards by waves.